Another reason is that Deportivo only started playing soccer in Gijón when they played against Sporting. That was a really good match, but Lotina screwed it up with the changes. Juan Domínguez was completely lost and after Lotina made the changes the team started rolling back instead of attacking against Sporting goalie. Sporting tied the match on the ninety-third minute, Depor could have easily won that match 1 – 3. This happened during the whole season. Many matches were either lost or tied on the last minutes. This outcome was to be expected the way Depor played on preseason. No match was won until round 9 of La Liga when Depor defeated Espanyol 3 – 0 in Riazor. In January Depor was eight points away from relegation. I’m still sad, guess nobody was expecting this outcome. Anyway, we will be back. Lets hope is only one season playing in second division. 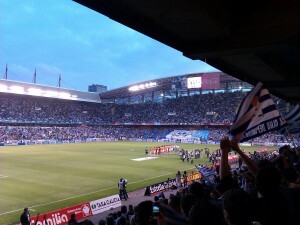 Depor before playing Valencia. Our last match in BBVA Liga.